Interest in psychic and paranormal phenomena has never been greater–which also means there is more confusion than ever about which unusual experiences are authentic. That’s why Jack Rourke’s perspective on human percpetion is so valuable. As both a practicing psychic and a dedicated parapsychological researcher, Jack is uniquely qualified to provide this inside-out, shockingly candid and thorough examination of what psychic perception really is… and what it isn’t. The Rational Psychic ™ begins with a story about a unique near death event the author experienced the moment his twin sister died. This heartwarming childhood tale is not meant to qualify Jack as a psychic. Instead, the author uses this story to teach readers that emotionally profound personal events are no reason to avoid rational investigation of one’s personal paranormal experiences. In The Rational Psychic™, Jack Rourke details how to discern genuine psychic information from the background noise created by the mind. Using facts and scientific references, Rourke presents a detailed, thoughtful, and often surprising explanation for seemingly supernatural events that will satiate the curious and inspire the believer to be the best they can be. 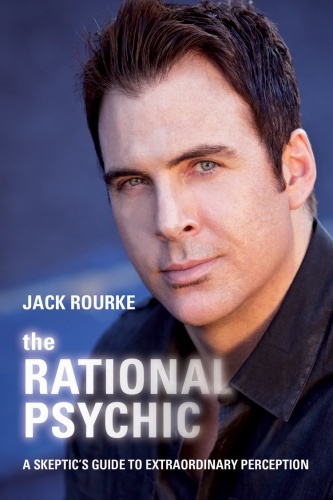 The Rational Psychic™ answers the tough questions about being psychic, empowering readers with facts and first hand accounts of real-life paranormal experiences. “You don’t have to surrender logic or adopt any exotic beliefs to accept that psychic phenomena are real,” Jack Rourke explains. “Nor do you have to automatically deny any evidence about the paranormal to be a critical thinker.” Whether you are seeking answers about your own mysterious experiences, interested in developing your psychic gifts, are looking to improve an existing ability or are simply a curious skeptic, The Rational Psychic™ is a must-read book that will challenge what you think you know while making complete sense of the unexplained.